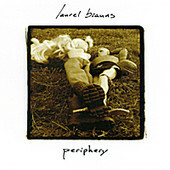 Singer-songwriter Laurel Brauns' brand of folk was raised on a steady diet of rock, pop, Americana, and, of course, folk. From string-laced, emotional songs that pull you in to stark piano numbers, through her more straight ahead folk, which comprises the majority of the record, Brauns always gets a big sound, even when she uses minimal instrumentation. But, when she gets down and goes for it, Brauns makes waves with her powerful, moving folk-rockers, her emotive voice giving the songs their bravado. I'll give this a B.